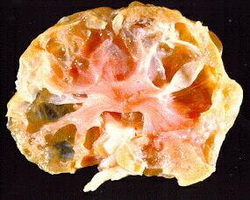 Polycystic kidney disease is the most common inherited cause of kidney failure in cats. It is common in the Persians (40%-60% are affected) and breeds that have used Persians in breeding programs such as: Exotics, Himalayans, American Shorthairs and Scottish Folds. 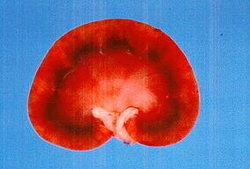 This is a kidney affected with polycystic kidney disease. How can it function this way? IT CAN'T!! Polycystic disease is a disease that shows up later in life (late onset) with enlarged kidneys and kidney dysfunction occurring between 3 and 10 years of age (on average at 7 years of age). Problems occur when these cysts start to grow and progressively enlarge the kidney, reducing the kidney's ability to function properly. The ultimate end is kidney failure. How will you know if a kitten you buy will develop polycystic kidney disease?? PKD is not contagious. 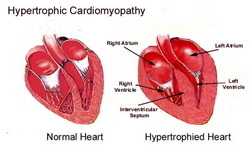 It's a known genetic disease with autosomal dominant inheritance. Veterinarian researchers are busy on the feline genome project. In 2005, a DNA test for PKD in Scottish Folds was created! Following in 2006, they developed the same test for British shorthairs! This is a healthy kidney. All breeding cats should be DNA tested for Polycystic kidney disease and guaranteed to be free from risk of developing this devastating condition. This is an expensive endeavor and many breeders just don't care enough to test their own cats!! Many breeders will tell you they have "never had a problem with PKD". What this means is that they stop breeding or place their cats by the age of 5, so they have never seen one of their cats with PKD (since it shows up on average at the age of 7). The only way to know for sure is to test via DNA!! Be an educated consumer! Osteochondrodysplasia is a disease that is unique to Scottish Folds. It was discovered that a folded ear Scottish fold was bred to another folded ear, many of the offspring developed a severe crippling lameness early in life. Cats affected had shortened, malformed legs and tail as well as abnormalities affecting the growth plates and spine. As a result, the breed is outlawed by the Cat Fancy in the UK, the GCCF, and has strict breeding rules and regulations with another European Cat Fancy,FIFe. The breed was continued in the United States, however, and breeders determined that offspring of cats with folded ears to cats with normal ears did not have arthritis at an early age, and that half of the kittens (on average) had folded ears. 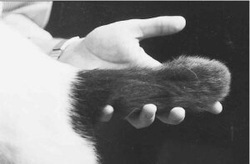 Thus, if the cat has only one copy of the folded ear gene (heterozygous) they did not show the arthritis that the cats with two copies of the gene (homozygous) did. 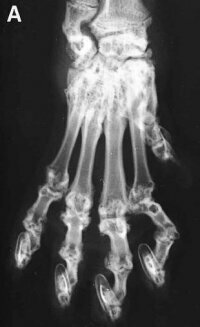 Research conducted in Australia in February 1999 suggests, for the first time, that even heterozygous Scottish Fold cats may also become afflicted with progressive arthritis. It suggested that cats homozygous for the Fold gene develop crippling arthritis at an early age and that heterozygous Folds also develop arthritis but more slowly. Indeed, this study suggests all Scottish folds with folded ears will eventually develop arthritis of various severity. Of course, the straight ear version of the Scottish Fold will never develop any arthritis as it does not have the folded ear gene. Many reputable United States Scottish foldbreeders believe that with very careful breeding practices the heterozygous Scottish fold can be free from osteochondrodysplasia. Australia, where all the studies have been performed, has very poor and unrefined stock of the Scottish foldand United States breeders have been breeding out the arthritis for many generations. However, I do not feel that Scottish fold breeders should stick their heads in the sand. Dr. Leslie Lyons of UC Davis is working with Scottish fold breeders to genetically map the Scottish fold gene that is responsible for the folded ear. I have a friend who is trying to work with her in hopes of getting to the bottom of the osteochondrodysplasia issues of the Scottish fold and I encourage other breeders to do the same, but research takes time. In the meantime, PLEASE BE AWARE that Scottish folds should be bred ONLY folded ear to straight ear and are not to be bred by people who are not dedicated to the health and well-being of these animals. Make sure that if you are purchasing a kitten that it's tail is long and flexible. Watch it run and play. And, most importantly, make sure that you buy it from a breeder who shows cats in an organization. If a breeder does not show or do well in the shows, be warned that they likely do not show because they have problems with osteochondrodysplasia that would disqualify them in the show ring.